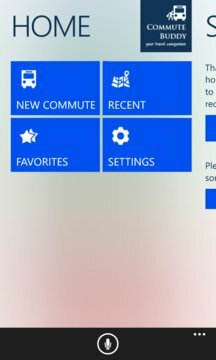 Commute Buddy for WP8 is a travel companion app for people who commutes on a daily basis. The app tracks your commute and notifies you once you approach your destination based on the configuration settings. 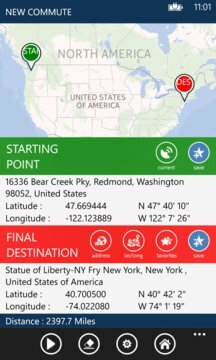 Notification can be set based on Time left or Distance left to your current destination and can be set using the settings page. The app make your commute worry free, meaning worry no more about missing stops. Ideal for people who would like to sleep during their commute. The integration with Bing places, and advanced features like Voice Commands make it a compelling app. You could launch the app and navigate straight to the New Commute screen straight from the Bing Place details page. Following are some of the key features of the app. 1) Attractive and intuitive UI that adheres to the WP design guidelines. 2) Tracks your commute and notifies you as you approach your destination. 3) Customizable Notification and tracking options. 4) Ability to save destinations to favorites for future use. 5) Ability to set destinations using address, latitude/longitude or favorites. 6) Ability to pin favorites to home screen. 7) Stores the last 10 commutes under recent. 8) Fully optimized for WP8. 9) Supports all three Tile sizes. 10) Support Voice Commands. Ability to launch and navigate to straight to the new commute screen with the current location and destination set straight from Voice Command. 11) Bing Place card integration. 12) Ability to share location or commute information through text, email or social media. 13) SkyDrive integration for data backup/restore. 2) Stability improvements all through out the app. 3) Improved auto tracking interval update process.